Lao New Year, called Songkran (ສົງກຣານ) or Pii Mai (ປີໃໝ່), is celebrated in Laos every year from roughly April 13 to April 15 (varying slightly depending on the Buddhist luni-solar calendar). 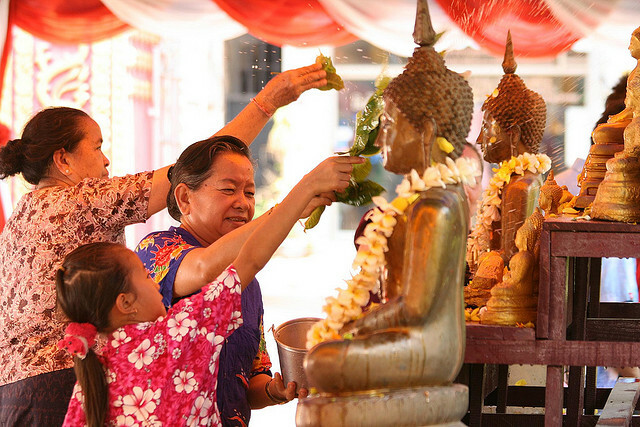 Lao New Year is the most widely celebrated festival in Laos. 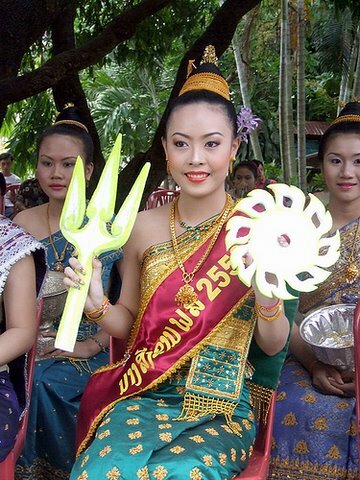 The festival is also celebrated by the Lao in the U.S., Canada, France, and Australia. 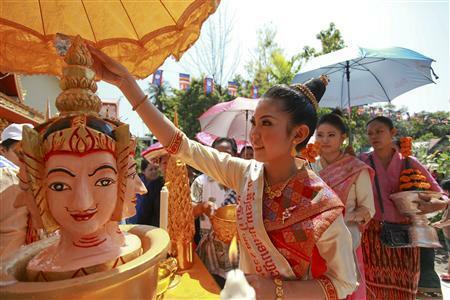 Lao New Year takes place in April, the hottest time of the year in Laos, which is also the start of the monsoon season. Lao New Year takes place at roughly the same time as the new year celebrations of many countries in South and Southeast Asia. According to a Lao legend, the Pii May celebration started after Thao Kabinlaphrom lost his life in a bet to a man named Thammaban Khuman. Thao Kabinlaphrom was not able to solve a three-part riddle. Per his request, his seven daughters (representing each day of the week) took great care not to let his severed head touch the ground or there would be great destruction throughout the world. The head was kept at the sacred mountain Sumeru until Pii May of each year when each daughter would take turns washing it. Today, this story is re-enacted during the Lao New Year celebration. The community chooses one woman to represent Nang Sangkhan one of the seven sisters, to lead a procession while displaying a replica of Thao Kabinlaphrom on a ceremonial tray called Khan. The Nang Sangkhan contest takes place in many towns in Laos but the one in Luang Prabang, the old capital, is the most widely known. There are seven contestants, each one symbolizing one of King Kabinlaphom’s seven daughters. Pii May Lao is a three-day event. On the first day, or the last day of the old year, people clean their houses in preparation for the New Year. 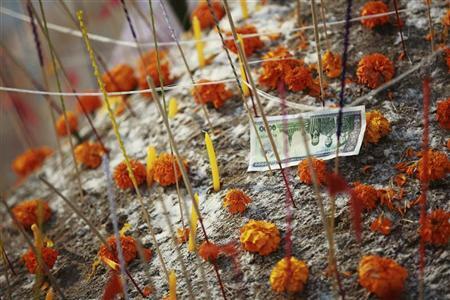 On this day, people earn merit and blessings by building mounds of sand, usually on the river banks and temple (wat) grounds, which are then decorated with small triangular flags, flowers, money, and candles. These sand mounds, called stupas, symbolize the mountain where King Kabinlaphom’s head was kept by his seven daughters. This year (2014) it falls on April 13. The second day is called Sangkhan Nao, which is the day between the old and the New Year (This day is considered neither to be part of the old year or the New Year). Sangkhan Nao is also known as the day of rest, which means all work is forbidden. Only fun actvities should take place such as visiting relatives and friends, taking a day trip or the customary throwing of water on friends and passersby. At night time, there is usually a Lamvong or circle dancing party and everyone dresses their best to celebrate with food and drink well into the night. The third day of the Lao New Year is called Sangkhan Kheun Pii May. It is the start of the New Year and is the most joyous day of the festival. 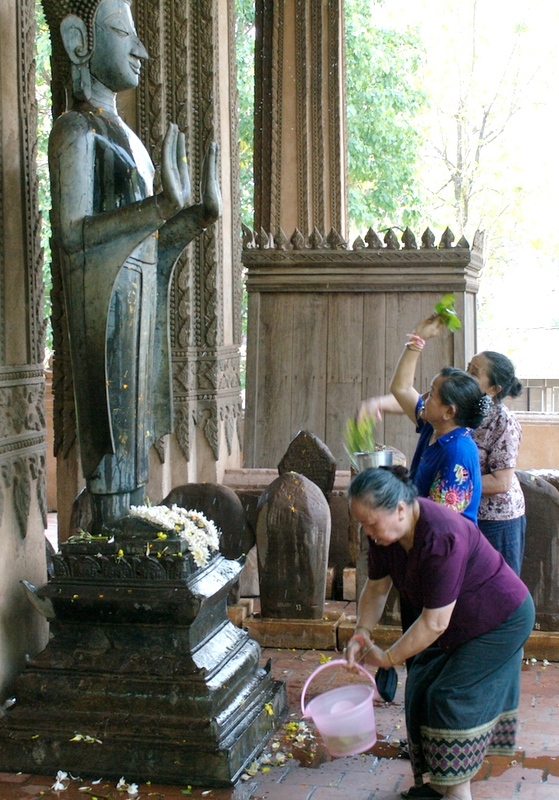 People go to the wat and make offerings to gain merit. Young people prepare scented water with flowers and visit their grandparents, parents, and elders. They rinse the elders’ hands with the water and ask for their blessings and forgiveness for any wrong?doings in the past year. At home they engage in a special family ceremony called the Suukhwan or Baci to welcome the New Year in which participants then take turns tying the blessed white strings around each other’s wrists to wish them good luck and prosperity for the New Year. Another way to gain merit at this time is to set animals free. The Lao believe that even animals need to be free. The most commonly freed animals are tortoises, fish, crabs, birds, eels, and other small animals. Flowers are gathered to decorate Buddha images. In the afternoons people collect fresh flowers. Senior monks take the younger monks to a garden filled with flowers, where they pick flowers and bring them back to the wat to wash them. People who didn’t participate in the flower picking bring baskets to wash the flowers so the flowers can glisten with the Buddha statues. In the evening Lao people usually go to the wat to worship. Lao cuisine is both similar to and distinct from other Southeast Asian cuisines as the people of Cambodia and Thailand have influenced one another through migration. The Lao originally came from the north in a region that is now part of China. As they moved southward, they brought their traditions with them. The staple food of the Lao is steamed sticky rice, which is eaten by hand. In fact, the Lao eat more sticky rice than any other people in the world. Sticky rice is considered the essence of what it means to be Lao — sometimes the Lao even referred to themselves as “Luk Khao Niaow”, which can be translated as “children of sticky rice.” Galangal, lemongrass, phak phaew,and padaek (Lao fish sauce) are important ingredients. The most famous Lao dish is larb (ລາບ) also spelled laap, lahb, or laab, a spicy mixture of marinated meat or fish with a variable combination of herbs, greens, and spices. Without the right seasonings you cannot reproduce larb at home, but they are not absolutely impossible to find in the West as long as you have a decent Vietnamese grocery store available (as I did in New York). You can substitute any really hot chile, such as scotch bonnet, for the birdseye chiles. Phak phaew is also known as Vietnamese mint or Vietnamese coriander (not to be confused with Thai basil – although this might work as a substitute). Young ginger root can be substituted for galangal but you will need to use more because galangal is very potent. 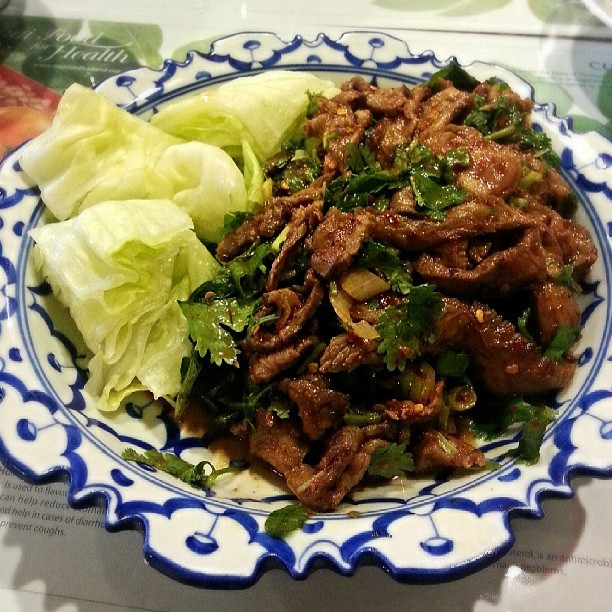 Larb can be made with a variety of meats (beef, pork, chicken), or fish. Sometimes it is made using marinated raw fish like ceviche (and there are also versions with raw meat). It is also often served with ground meat cooked briefly in a wok. My recipe uses tripe (because of my obsession), but you can simply double the amount of beef if you prefer. To make the rice powder, toast sticky rice in a wok or heavy skillet until it is golden brown and then pound it in a mortar or grind it in a food processor. Larb is always served with sticky rice and usually with sliced fresh vegetables and/or bean sprouts. The latter can be seasoned with fish sauce and hot peppers, which should be available at the table along with lime wedges. You may also add extra seasonings to taste to the larb at the table. To eat larb, take a portion of sticky rice in the first two fingers of your right hand and then pick up some larb (and vegetables), also with the right hand, on top of it. Mix the marinade ingredients in a bowl. Put the beef and marinade in a zip top bag and close the top except for a small hole. Carefully squeeze out all the air and then completely seal the bag. Refrigerate for 30 minutes or longer. It can marinate overnight if you prefer. Cook the beef on a charcoal grill, until it reaches the desired stage. Medium-rare is most common in Laos. Slice the beef very thin and toss it in a bowl with the remaining larb ingredients. Season to taste with padaek, fish sauce, and lime juice. Serve with raw vegetables, chiles, mint and sticky rice.